I have been involved with glass for over 35 years, first as a student at the School of the Art Institute of Chicago and currently as a full time glass artist with a studio near Amherst Junction, Wisconsin. 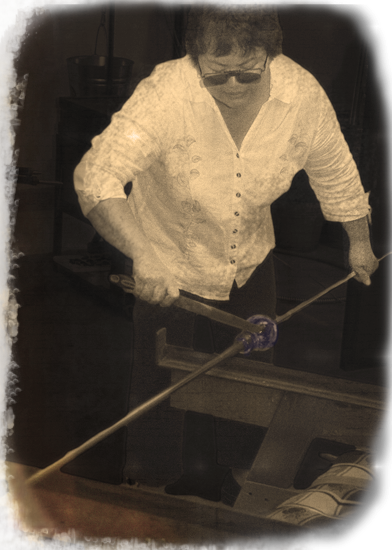 I create works of art and functional objects using glass as the basic medium. I believe in the simplicity of form and color and the fact that "accidents" are a beautiful thing. I am not the "master" of my medium. I simply go with the flow of the process as a witness, a participant and a supervisor. The end result is a one-of-a-kind object that will hopefully endure current trends and fads; a piece that will make a connection with artist/craftsperson and the viewer/patron. All the pieces start out as molten clear glass. I add colored glass in the form of chards, chunks, chips, powders or cane (thin rods or threads) at various stages of the blowing process. They are then mouth blown and shaped with wooden and metal tools. Once completed, The piece is cooled overnight in an annealing oven which brings the temperature down from a working high of 2000 degrees to around 300 degrees. Once completely cool, the piece is ground on the bottom using a grinding wheel and grit. All of my pieces are designed and made by me using no other help in the process.